optional toppings: fresh Dill, fresh Chives, smoked salmon, crumbled nitrate-free bacon such as Applegate brand, and/or sliced red onion. Slice the bell peppers into ½ inch rings. Use a sharp knife to make clean cuts (to better hold the egg in place). Remove the white inner flesh and seeds. Heat the skillet on medium heat and coat with non-stick coconut oil cooking spray. Let the pan heat up before adding food. Place the pepper rings in the middle of the pan. Allow the rings to cook and brown lightly before adding the egg. Turn the rings over a few times so both sides cook evenly. 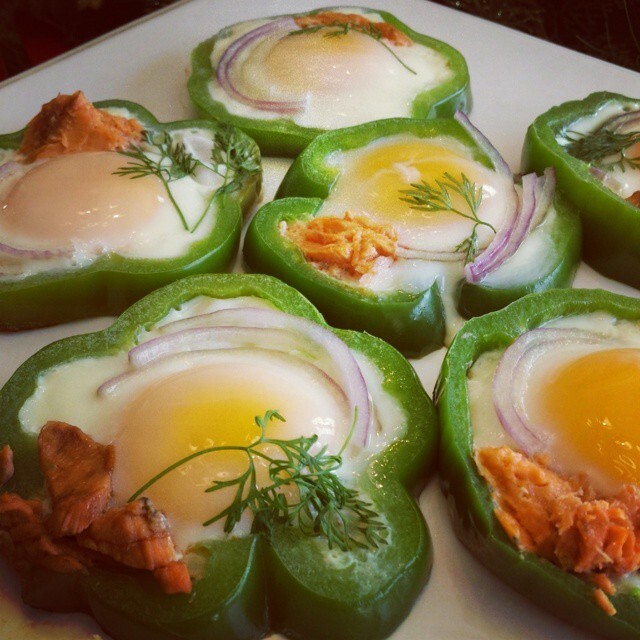 Gently add one egg to the middle of each bell pepper ring. Cook over low heat until yolks firm and egg whites harden and are no long translucent. Part of the CleanFoodLove bundle. You can order it today!